Embryonic stem (ES) cells differentiate efficiently in vitro and give rise to many different somatic cell types. Hematopoietic progenitors present within differentiated ES cells (embryoid bodies, EBs) can be identified by replating EB cells into semisolid media with hematopoietic growth factors. The developmental kinetics of various hematopoietic lineage precursors within EBs and molecular and cellular studies of these cells have suggested that the sequence of events leading to the onset of hematopoiesis within EBs is similar to that found within the mouse embryo. Thus, the in vitro differentiation model of ES cells provides a unique opportunity to study onset mechanisms involved in hematopoi-etic development. Key Words: Embryonic stem cell; in vitro differentiation; embryoid body (EB); heman-gioblast; blast colony forming cell (BL-CFC); hematopoietic development. 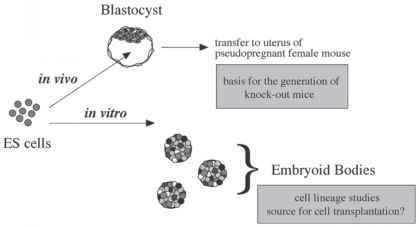 Embryonic stem (ES) cells are derived from early stage embryos (blastocysts). When plated onto a feeder layer of fibroblasts, the inner cell mass of blastocysts will give rise to colonies of undifferentiated cells (ES colonies), which can be isolated and further expanded. Once established, ES cells can be maintained as pluripotent stem cells on a feeder layer of fibroblasts. 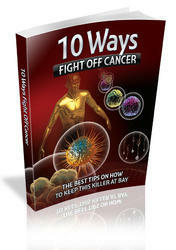 One of the factors responsible for maintaining ES cells as stem cells is leukemia inhibitory factor (LIF; refs. 1 and 2). When introduced back into a blastocyst, ES cells can contribute to all tissues except the extraem-bryonic endoderm and trophoblast of the developing embryo (3,4). It is this particular trait that makes ES cells a valuable tool for genetic engineering (Fig. 1). In addition, ES cells differentiate efficiently in vitro and give rise to many different somatic cell progeny (5-25). Hematopoietic progenitors develop sequentially within EBs. The first to develop is the blast colony-forming cell (BL-CFC). BL-CFCs are transient and develop prior to the primitive erythroid population (26,27). Definitive erythroid and myeloid progenitors develop shortly after primitive erythroid progenitors (Fig. 2). Fig. 1. In vivo and in vitro application of ES cells. Fig. 2. Hematopoietic development in vivo vs in vitro. Hematopoietic differentiation within EBs recapitulates the in vivo sequence of hematopoietic development. In the developing embryo, primitive erythroid cells develop prior to definitive hematopoietic progenitors. This sequence is preserved in developing EBs. 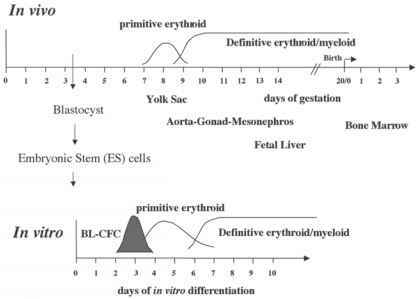 Moreover, BL-CFCs develop in EB before primitive erythoird progenitors. Both BL-CFCs and primitive erythroid progenitors are transient cell types. Scales on the y-axis are arbitrary. BL-CFCs form blast colonies in response to vascular endothelial growth factor (VEGF), a ligand for the receptor tyrosine kinase, Flk-1 (28). 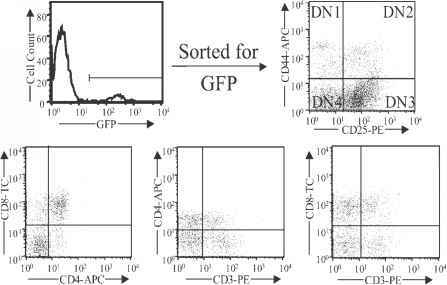 Gene expression analysis indicated that cells within blast colonies (blast cells) expressed a number of genes common to both hematopoietic and endothelial lineages, including Scl, CD34, and Flk-1 (26). In addition, blast cells are clonal and give rise to primitive, definitive hematopoietic, and endothelial cell progenitors when replated in medium containing both hematopoietic and endothelial cell growth factors (26,27). Collectively, these studies strongly argue that BL-CFCs represent the hemangioblast, a common progenitor of hematopoietic and endothelial cells. In this chapter, we will discuss how to analyze various hematopoietic progenitors developing within EBs. Special emphasis will be given to BL-CFCs.